“Riders” – a relatively little-known picture of M. V. Nesterov. Until recently, the picture remained unknown (from the available images it can be judged that it was stored in a folded position). Perhaps the picture is a sketch for the unwritten large canvas. This can be judged by some freedom of drawing and non-prescribing of details, not typical for other works of the artist. The plot is based on the famous Trinity siege, one of the many battles of the Time of Troubles. Monumentality of the plot is emphasized by the vertical format of the picture. In its center – the monastery towers, as if aspiring upwards. This striving upward can be seen in the whole picture, even in a small tree in the lower corner. And this monumentality is crossed out by three dark horsemen on white horses. These are the elders-hermitages sent to Moscow with the news of the siege. According to one of the legends, these three elders are the disciples of Sergius of Radonezh, who died two centuries earlier. Partly because of this, there is some unreality of what is happening. 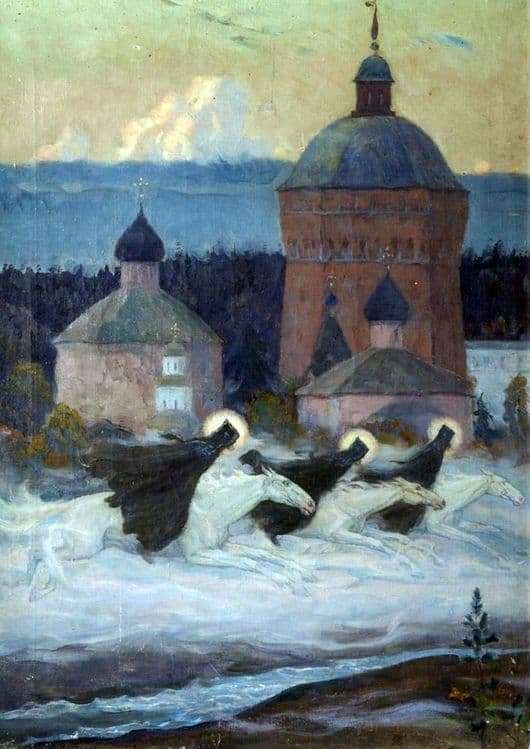 The enemies saw only three monks on thin horses, rushing like winged ones. The white color of horses symbolizes purity, truth. Nimbus above heads is holiness. This is one of the main ideas of the painting “Riders”. Black cloaks – the traditional attire of monks. Their color comes in contrast with the horses and snow, drawing the viewer’s eye to the main characters of the canvas. Nesterov found one of the most original and expressive ways to convey this legend. For the artist himself, the composition is also quite unusual. There are no large figures in the foreground and boundless spaces. Perhaps this is only part of a huge unwritten canvas. Unlike the composition, the color solution for Nesterov is quite typical. There is a lot of snow and lilac-purple hues.